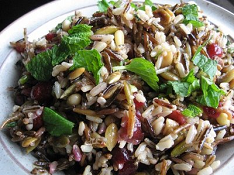 By soaking the wild rice we decrease cooking times significantly. You will know the rice is done when the seeds split open. Bring water and rice to a boil and then turn down heat and cook for 30-45 minutes. When finished let cool. Toast pumpkin seeds lightly in a toaster oven, about 5 minutes. When rice is cool add the remaining ingredients. All all ingredients together and mince or blend until oil and vinegar no longer separate.